Among the prominent business interests of Bayou Sara is horse dealing, it being a horse market for the surrounding country. Large droves of horses are brought here for sale from Kentucky and elsewhere. Messrs. Henshaw and Haile have very extensive stables and do a great deal in horse flesh. J.H. Henshaw, age 33, born in Pennsylvania; occupation: livery stable; $5000 real estate. Elizabeth Henshaw, age 25, born in Illinois. Emma Henshaw, age 7, born in Illinois; attended school. 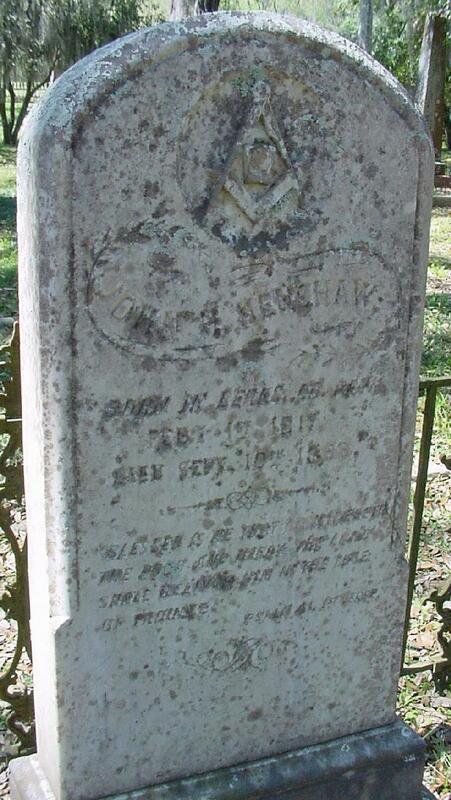 Augusta Henshaw, age 6, born in Louisiana; attended school. Daniel Henshaw, age 4, born in Louisiana. Shown in the 1850 census immediately next door to the J.H. Henshaw family was a dwelling labeled by the census enumerator as "Hotel - Henshaw House". It was shown with a J.A. Kelly, hotel keeper.15 It is unknown what connection there might have been between the hotel and John Hoover Henshaw. Elizabeth Henshaw, age 27, born in Illinois. Emma Henshaw, age 9, born in Illinois. Austin Henshaw [sic], male [sic], age 7, born in Louisiana. Elizabeth and children were shown living in the household of a Mary McCoy (perhaps they were temporary borders). It is unknown why or how the family was enumerated both in Louisiana as well as Illinois, but it might be that they were traveling between locations during 1850 and were counted twice. J.H. Henshaw, male, age 43, born in Pennsylvania; occupation: stock dealer; $10,000 real estate; $12,000 personal property. A. Henshaw, female, age 36, born in Pennsylvania. E. Henshaw, female, age 18, born in Illinois. A, Henshaw, female, age 17, born in Illinois; attended school. 1 black male age 44. 1 black female age 23. 1 black female age 21. 1 mulatto female age 14. 1 mulatto male age 12. John and family were apparently not included in the 1870 census of Louisiana,23 so it appears that they probably had moved away before 1870, apparently to Vicksburg, Mississippi. Note: John Hoover Henshaw's lineage seems very much in doubt. John Hoover Henshaw has been shown as son of an unknown John Henshaw (died 1-8-1847, married Magdalena -).6 This John has also been reported to be the son of John Henshaw & Mary Stedman, which is also seemingly impossible since their son John was born in 1730, far too distant in the past to be John Hoover's father. 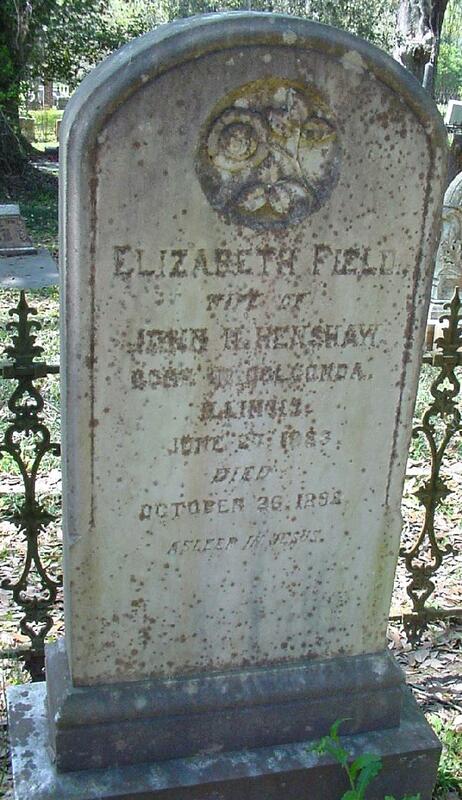 This John has also been shown as the son of Thomas Henshaw & Eliza Field of Virginia,24 which is contradicted by censuses for John which show he was born in Pennsylvania (additionally, the John Henshaw who was son of Thomas Henshaw & Eliza Field married, lived and died in Johnson County, Missouri). In an 1855 letter, John Henshaw #4523 mentioned that he had been in correspondence with John Hoover Henshaw, and in the letter he stated "his father if living, resides in Butler Co., Pennsylvania and must be at this time if alive some 82 years of age".12 (this would make his father born in approximately 1773). The Church Of Jesus Christ of the Latter Day Saints (LDS) International Genealogical Index (IGI) - Louisiana. "Field Genealogy", by Frederick C. Pierce; CS71.F453. 1850 census, West Feliciana Parish, Louisiana; family #63; USGenWeb Archives. Contribution from David Herron (). Contribution from David Herron () citing: notes from Emma Raum Irvine, 1949. Gravestone photo courtesy of David Herron (). "Old Louisiana Plantation Homes and Family Trees" by Herman de Bachelle' Seebold, M.D. Vol. 1; USGenWeb Archives. 1850 census, Bayou Sara, West Feliciana Parish, Louisiana; roll M432-231, page 257, line #34, dwelling #60, family #63. 1850 census, Bayou Sara, West Feliciana Parish, Louisiana; roll M432-231, page 257, line #21, dwelling #59, family #62. 1850 census, Pope County, Illinois; roll M432-125, page 266B, line #36, dwelling #257, family #257. 1860 census, Bayou Sara, West Feliciana Parish, Louisiana; page 116, line #16, dwelling #32, family #32. 1860 Slave Schedule, Bayou Sara, West Feliciana Parish, Louisiana; page 254, line #25. "Records of Louisiana Confederate Soldier", by Andrew B. Booth, Vol. 2; USGenWeb Archives. "Civil War Service Records"; http://www.ancestry.com.